Step 1 Place the noodles into a bowl, add hot water and leave for a few minutes until soft. Step 2 Combine the lettuce, cabbage, onion, cucumber, capsicum, prepared noodles and cashews into a mixing bowl. Step 3 Drizzle the peanut oil in a pan over medium heat. Cook the chicken in the pan on each side for 4-5 minutes. Step 5 Remove it from the heat and place onto a board to rest for a few minutes. Step 6 In a small jar, add all dressing ingredients and mix well. Step 7 Dress the salad in a mixing bowl and toss gently. Step 8 Slice the chicken and serve with the salad. 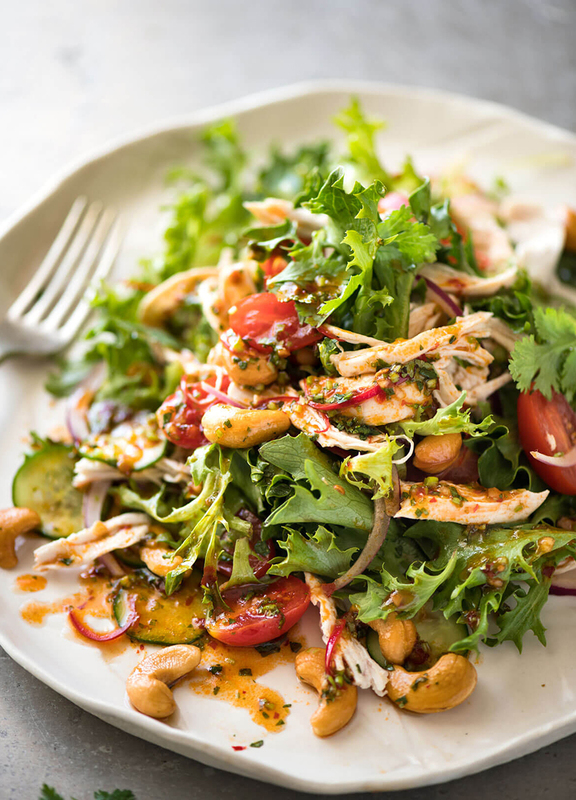 Light and bright, this is the perfect summer salad! You can always switch out the chicken for other protein sources, such as soft boiled eggs, shredded grass fed beef or grilled tofu.